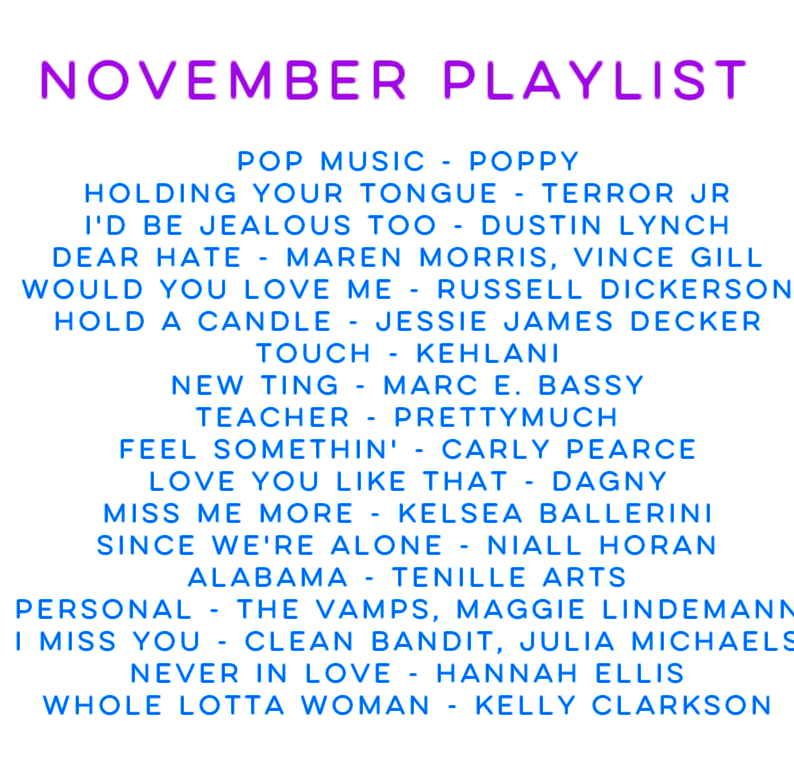 Halloween is over and it's definitely getting colder, and while that may be a little sad, there's no time for that because so many new jams are here!! Before I even say anything else, I need to tell you to go listen to Russell Dickerson's album, Yours, right this second, because I am so obsessed with it it's not even funny. Pretty sure you'll be feeling all the feelings before you even get to the title track. Next, play this entire playlist bc it's really that good. If you like country, go listen to Hannah Ellis' self-titled EP and Tenille Arts' new album, Rebel Child, and if you like pop, go listen to Marc E. Bassy's album, Gossip Columns, and basically anything Julia Michaels has ever done. Hope you find some new faves on here like I have! 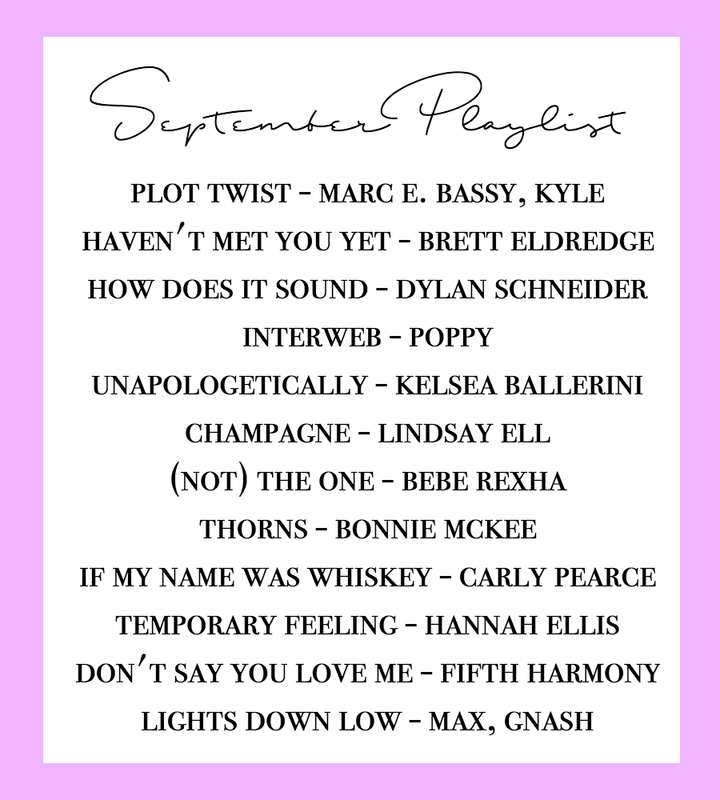 Also, join me in the coming weeks as I fangirl over Kelsea Ballerini's new album and (hopefully) Ms. Swift's new Reputation bc your girl will have THOUGHTS. See you soon! Hello all! 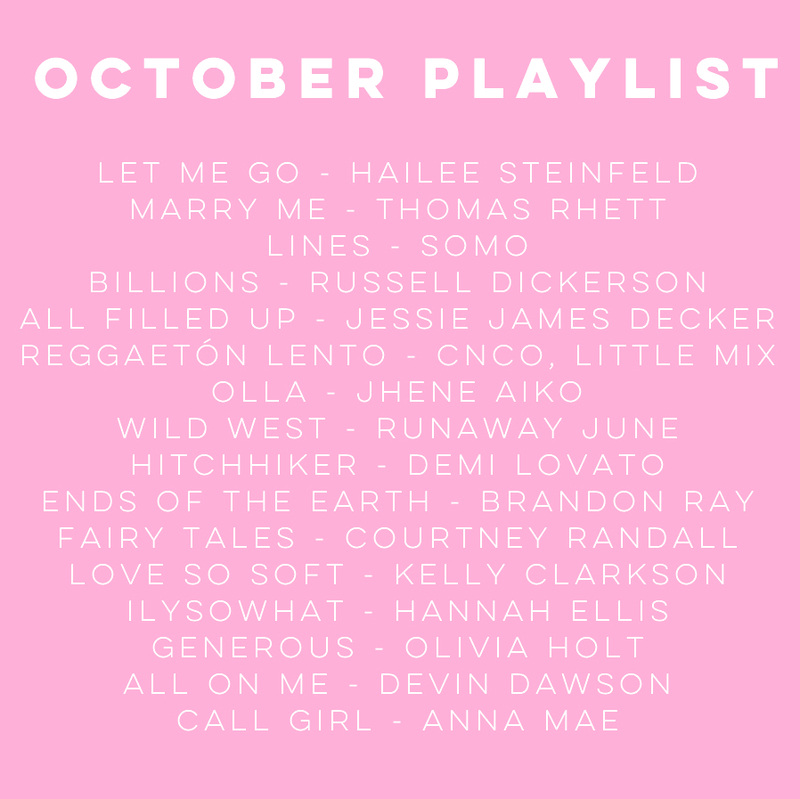 Cannot believe it's already October — aka my birthday month, and yes I do feel old — but this month's playlist is so good and sparkly that I can't wait to share it! First things first, if you're a country fan, listen to Runaway June's 'Wild West' literally ASAP, because that song is seriously gr8. I love it, you love it, we all love it. As I expected, Thomas Rhett's new album is excellent, and 'Marry Me' is one of my favorite songs from the record. I have to say, I thought the song was going in one direction and then it totally got me, and I always think that's really cool when writers can switch it up on you like that. As far as pop, 'Generous' is a serious bop and probably the strongest song I've heard from Olivia to date, 'Hitchhiker' is easily one of the best songs from Demi's new album and I am very here for the new Kelly Clarkson era. Also, FGL's pop collaborations have been fire lately — go listen to 'Meant to Be' with Bebe Rexha if you haven't like, right now. Tbh, I realize this playlist is long (although not as long as Taylor Swift's banger of a Spotify playlist), but every song is pretty fantastic so you should really listen to them all. Happy October! Britney Spears in Vegas: It's Britney Betch!! Y'all, it finally happened!! I went to see Britney Spears in Vegas and my life is now complete, thank u and goodnight. I have to say that I am somewhat refusing to acknowledge that it is actually September because that means summer is over. I love Halloween as much as the next gal (Britney comin' at ya again for year five), but at the risk of sounding like a total cliché, there's just something about those summer nights, you know? 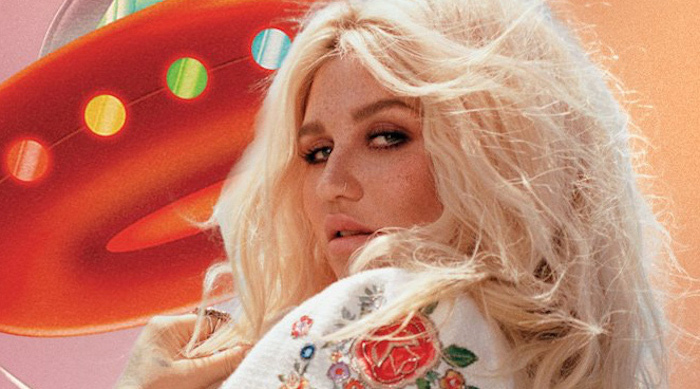 As far as music goes, though, I am really digging my playlist for this month, a specific highlight being 'Let 'Em Talk,' one of my favorites from Kesha's excellent new album (peep my thoughts in it here). Tbh I had trouble picking which of her songs to put on here bc the whole thing is so good, so also be sure to bump 'Hunt You Down' if you're feeling twangy. Also, my kween Bebe Rexha released new music last month, and I also had a v hard time choosing between '(Not) The One' and 'Meant to Be,' her unexpected yet fabulous collab with Florida Georgia Line. Other standouts include 'Lights Down Low,' the best slow jam I've heard in a while, 'Temporary Feeling' and 'Haven't Met You Yet.' Darn that Brett Eldredge for making me feel some type of way. 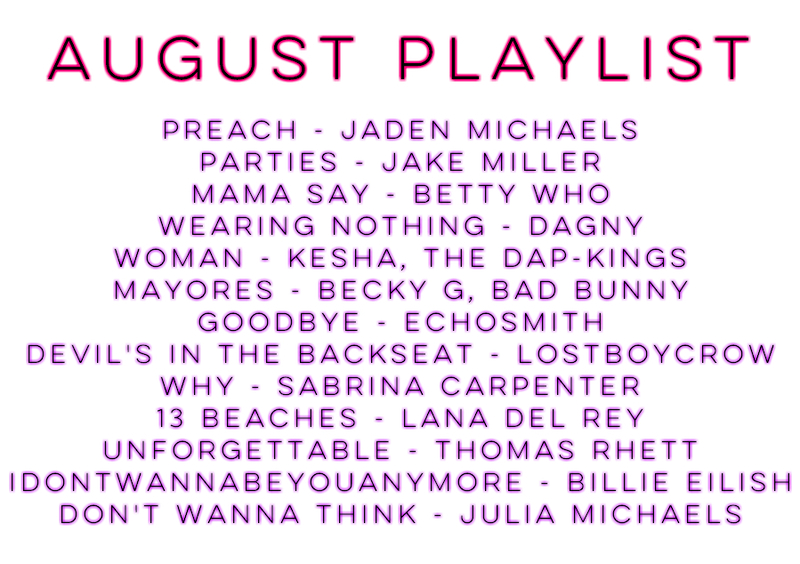 As always, check the playlist below! Tbh I had no idea what to expect from Kesha's new album, Rainbow. Would it be an album of emotional ballads addressing her Dr. Luke drama like 'Praying?' A callback to her previous electro-pop sound? 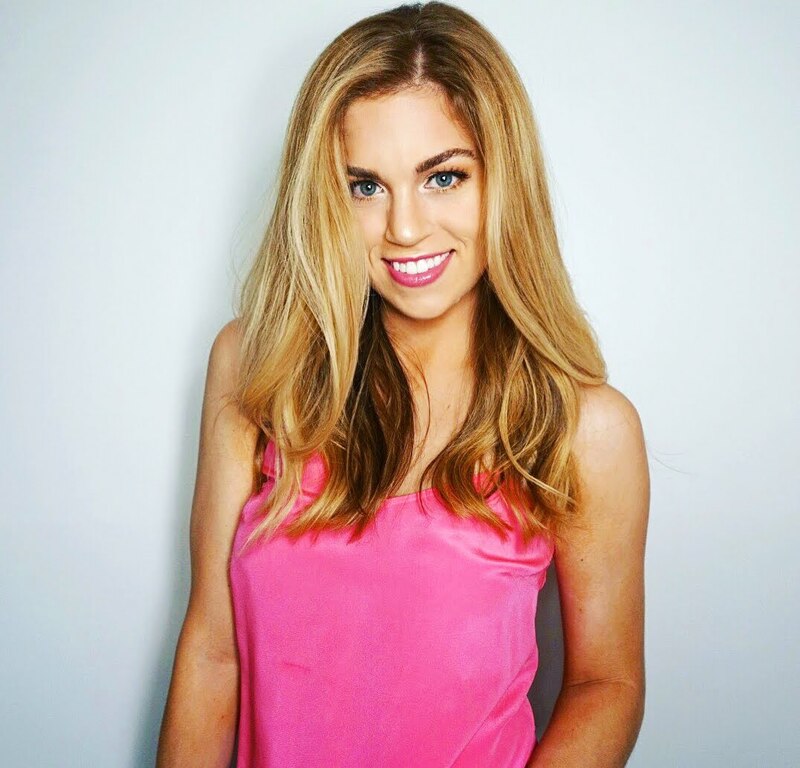 A new, country-fied version of the singer à la Gaga on Joanne? A trippy space odyssey? Frankly, it's kind of all four. Y'all I am sO excited about this playlist bc it is chock full of goodies and I'm obsessed. First thing I need to say is that I almost cried when I heard Thomas Rhett's new single, so that's that and I'm not even ashamed. Second thing is that the Michaels sisters are so talented it's insane, and Jaden's single and Julia's EP are both totally gorgeous and you should listen to them ASAP. Third thing is that I am now seriously obsessed with Betty Who and Jake Miller, and the fourth thing is that Becky G has had me on a major Spanish pop kick as of late. That's all. Happy August! Hello frands! I'm not sure how July is already almost over, but summer is in full swing and that means summer concerts! While I am slightly disappointed to say that the last show I went to was CMA Fest at the beginning of June, I am hopeful that the rest of the warm weather will bring more nights spent with my faves enjoying some major bops. Check the post below to see which shows I'm hoping to hit up this summer, and let me know if you've seen/will be seeing any of the same! Shawn Mendes — I'm not sure why, but there's something I really enjoy about going to concerts and being surrounded by screaming tweens. I'm not sure if it's a nostalgia thing or a fangirl thing but all I have to say is that this boy can write a song. John Mayer — Possibly reformed and incredibly talented artist who happens to give excellent advice on Twitter. Have you heard 'In the Blood'? Cause ya should. Betty Who —I am going to be 100 percent honest here and admit that I had never listened to Betty Who until last week, but you can bet I'm a fan now. Start with "Mama Say" and work your way through girlfriend's two spectacular albums and you'll see what I mean. Bruno Mars — It's obviously a known fact that Bruno can put on one heck of show, and to see it in person would be hands down amazing. Although I might die if I hear 'Versace on the Floor' live because that song does things to me. 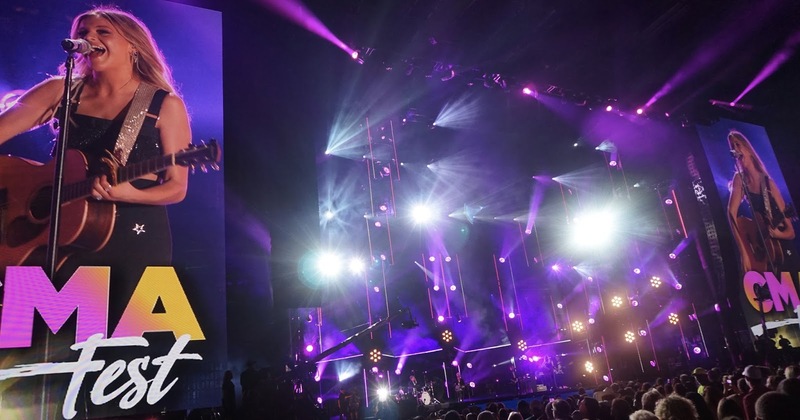 Lady Antebellum, Kelsea Ballerini and Brett Young — Three of my faves together in one show? You bet your behind I'll be there ready to hunt down whatever Kelsea is wearing so I can go buy it. Can't wait! Jake Miller — Jake has for some reason not yet announced a Nashville date for his current tour, but thanks to his most recent album (2:00am in LA) and how good it was, I would consider road tripping for this one. Sam Hunt and Maren Morris — Obviously no list would be complete without bae, and the fact that Maren Morris is his opening act makes me want to see this show even more than I normally would, which puts my anticipation level off the charts. Ed Sheeran — Yes, I am aware that his two concerts in Nashville are sold out, but I'll be darned if I don't try and get tickets. Please sign me up for two hours of this ginger wonder playing his gorgeous songs with no band and only pure talent to back him up.